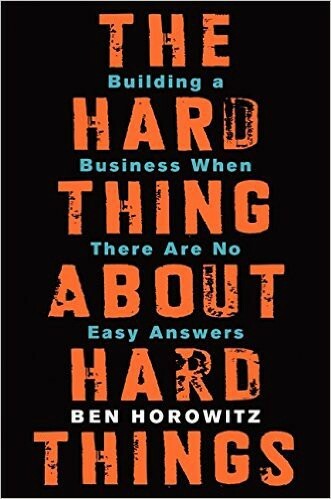 The Hard Thing About Hard Things has been the most recommended book to me from numerous conversations with great entrepreneurs. It’s reached the point now that if I ask for a book recommendation for business advice, I add ‘other than the obvious Hard Thing About Things’. Why is it so good? Most business books focus on how to do things correctly, whilst Ben acknowledges upfront there is no such thing as a perfect business and however much planning you make, screw-ups will inevitably happen. He addresses all the major screw-ups that have occurred during his time leading billion $ corporations and how his team made decisions to turn things around or screw things up further. He outlines the hardest decisions he had to make and the awful situations you find yourself in. They say entrepreneurship is the about crazy highs and terrible lows and this book paints the full ugly picture of what life is like in the daunting face of disaster. A true understanding of what you can face as an entrepreneur is invaluable which I believe is what makes this book a favourite. Examples: let the situation define the culture, violates all protocol, doesn’t have time read books about goals, has no backup plan and conflicts with anyone that gets in the way of the plan. No recipes for success or Silver bullets to solve problems. ‘Life is struggle’ — In the moments you feel like hiding and dying, that is when your role is most important and you can make the biggest difference. If you statistically have 1 in 10,000 chance of success your task is the same, make and execute a plan. The way of the warrior: Keep death in mind at all times. Live each day like it may be your last and conduct yourself properly in all your actions. You may experience overwhelming pressure to be overly positive. Stand up to the pressures, face your fear and say things as they are. Breed a culture of trust and get people working on problems instead of covering them. A healthy company has a culture of sharing bad news and freely discusses it’s problems and solves them. Just picturing the worst possible situation isn’t that helpful. Lay-off everyone, waste your shareholders money, lose your house (and your parents if they invested), disappoint customers and ruin you reputation…. Instead ask ‘What would you do if we went bankrupt’. It can be a source of good ideas and potential pivots. In Ben’s case the answer was to launch a new software company using an internal product they’d built. Then ask yourself if you can do that without going bankrupt? Whenever a large organisation tries to do anything, it always comes down to a single person who can delay the entire project. A manager may think they don’t have authority to make a decision or purchase, an engineer might get stuck. Minor hesitations can cause fatal delays. Make sure you remove all roadblocks and if anyone gets stuck on anything it must be diagnosed within 24 hours. Crucially important. If you don’t put people first the other two won’t matter. Making it a pleasure to work for the company means people feel they can be effective and efficient in their work and make a difference. Being a good company is non-essential when things are going well. But things always go wrong. And being a good company can be the difference between life and death. Make the hard decisions quickly and don’t put them off. Good CEO’s take the hard answer to organisational issues upfront before it accrues debt. e.g. Given the choice of cutting a popular project today that isn’t in the long-term plan or keeping it for morale reasons they cut it today. There is no perfect human or employee, hire for lack of weakness and a willingness to tackle thier weaknesses, rather than hiring for strengths alone. Your résumé gets stronger by working at a blue-chip company in its heyday. Oh, and you are getting rich. Have clear expectations of who you are hiring with a realization that there is something seriously wrong with every employee in your company (including you). Nobody is perfect. Involve multiple people in brainstorming but make the final decision solo. Consensus-based decisions tend to sway the process away from strength and towards weakness. As companies scale important work can go unnoticed, this must not be tolerated. Credit for hard work can be taken by managers and politicians and bureaucratic processes can choke creativity and drain the joy from the workplace. Maintain strict policies and processes on organizational design, performance evaluations, promotions, and compensation. Importantly — Don’t overcompensate and employee because they get a better job offer. Promote experienced employees by measuring results against objectives, management skills, innovation, and their ability to work well with others. Keep up regular performance management and employee feedback with a good system of one on one meetings between employee’s an managers. These are an essential platform for employees to discuss their as yet unheard brilliant ideas, pressing issues, and chronic frustrations. In a Hierarchy, members are promoted whilst they work competently. Ultimately they get promoted to a position they are no longer competent int (their ‘level of incompetence’). They are unable to earn further promotion and stay in a role they are not good at. The book follows his story as it happened and leaves you with a real sense of how to approach problems. They say your success is defined by how many hard conversations your wiling to have, and this book gives you the mindfulness to recognise the situations you need to step up and some of the tools to do it. Just reading bullet points from a summary isn’t the same as reading the whole story and if you want to actually have the lessons written above ingrained into your approach, then it is worth your time to read it. Enjoy the book and embrace the struggle to succeed.